The Eight of Pentacles symbolizes a concentrated determination to master a new skill being chosen as a new career path or creative undertaking. This card shows a diligent and hard-working attitude, and indicates. You are applying yourself fully to whatever is at the center of your attention. This card creates success through perseverance and individual initiative as opposed to luck or the generosity of others. The Eight of Pentacles suggests you are working in an effort to continuously improve your situation. You may be unhappy with your current state. And, you know you need to make some important changes in your life to increase your overall satisfaction. This card is a really positive sign. Commitment to making those changes and to ensuring you give yourself the best possible chance. As a result, this is a very hard-working and conscientious energy that is present in your life. In a tarot reading – the eight of pentacles – this cards brings encouragement. That helps to keep doing what you are doing as perseverance eventually lead to success. Yes, it requires a lot of dedication, focus and patience. The Eight of Pentacles may indicate further education or study in order to harness your skills. You may already be proficient in a particular skill set but you are now seeking to master those skills. The downside of the Eight of Pentacles is that by focusing on the details of your work or study, you may become a perfectionist. While it is important to get the details right, be aware of any tendency towards perfectionism where you may lose sight of the bigger picture. Make time and space for the relationship regardless of your jobs, otherwise things will suffer. If you are looking for love, then appearance of this card often tells us. You are actually too focused on money. What you do for a living to really create space in your life for a new relationship. Consider your priorities and where your time and energy goes. If you want love, make sure you have room for it. 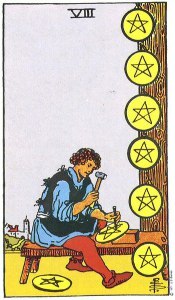 In a tarot cards interpretation we can find several meanings: Craftsmanship, Master, Expertise, Specialized, Hard work, Workaholic, Highly Skilled, Excelling, Ambition, Confidence, Dedicated, Absorbed, Concentration, Application, Productive, Attention to Detail, Getting On with Your Work, Completing Tasks, Projects, Giving it Your Best, Knowledge, Education, Scholarships, Mentoring, Qualifications, Multi-Talented, Training, Learning, Improving, Researching, Meeting Deadlines.